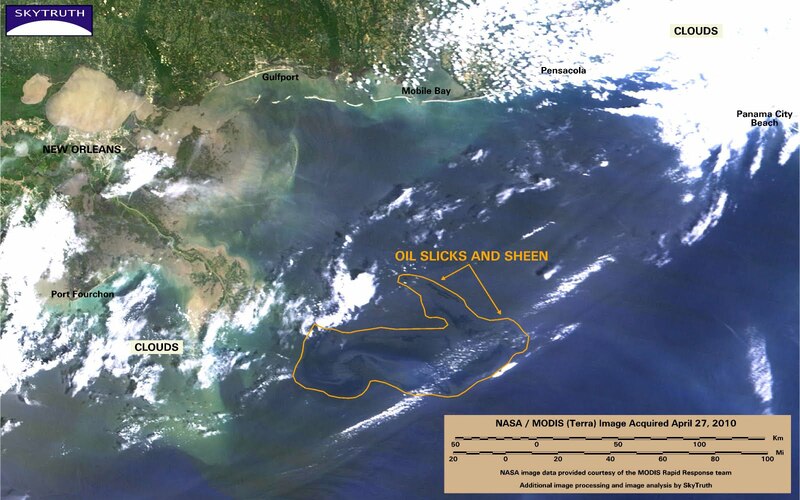 Gulf Oil Spill – 2 Million Gallons – Per Day? The Mobile, Alabama Press-Register has published an article by Ben Raines with an alarming prediction. 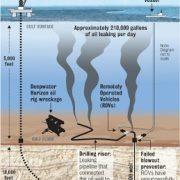 If the leaking well in the Gulf of Mexico shrugs off all control – the crippled blowout preventer, the wellhead, and any remaining control valves or baffles impeding the flow of oil and gas through the well – the rate of spillage could go to a whole other level: as much as 2 million gallons (150,000 barrels) per day. Schematic diagram of the leaking well and the relief-well drilling plan. Courtesy Times/Picayune. This worst-case scenario is based on the fact that there are individual wells in the Gulf of Mexico that produce 1.26 million gallons (30,000 barrels) of oil per day. That’s a controlled rate of flow. If all control were removed, the flow rate would be higher. How much higher? 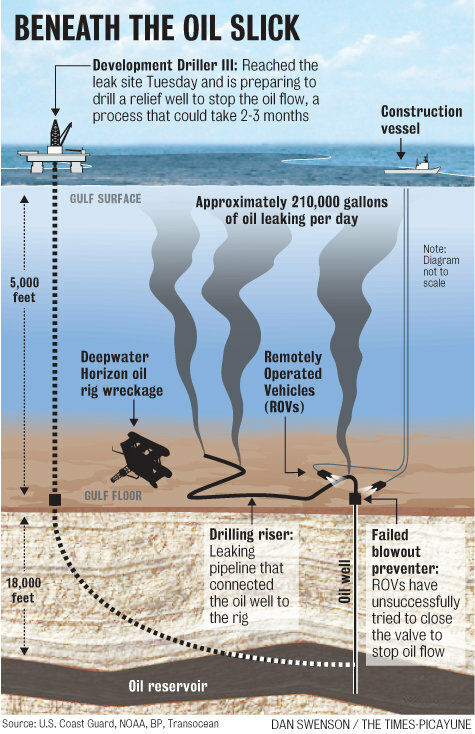 “Typically, a very good well in the Gulf can produce 30,000 barrels a day, but that’s under control. I have no idea what an uncontrolled release could be,” said Stephen Sears, chairman of the petroleum engineering department at Louisiana State University. https://skytruth.org/wp-content/uploads/2010/04/oilslickundergraphicjpg-57e28ddd55b0847f.jpg 400 259 John Amos /wp-content/uploads/2016/08/test_logo.png John Amos2010-04-30 19:39:002019-03-04 14:21:14Gulf Oil Spill - 2 Million Gallons - Per Day? 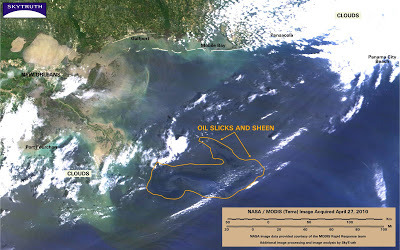 Satellite image from early afternoon of April 29, 2010 shows oil slick very close to shore. Today SkyTruth’s president did an interview on CNBC. You can watch it here; our bit starts at about 4:20. Gulf Coast folks, YOU CAN HELP show the world what’s happening by joining the new Flickr group, Gulf of Mexico Oil Spill 2010. Upload your photos, video and observations to let everyone know the impacts of this spill. Learn to geotag your work, and we’ll be able to pinpoint it on an interactive map. Just five months ago, SkyTruth’s President testified to Congress about the risks posed by offshore drilling. 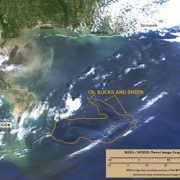 Now we’re seeing a catastrophic spill in the Gulf that could soon surpass the sorry benchmark set 20 years ago by the 11-million-gallon Exxon Valdez spill. 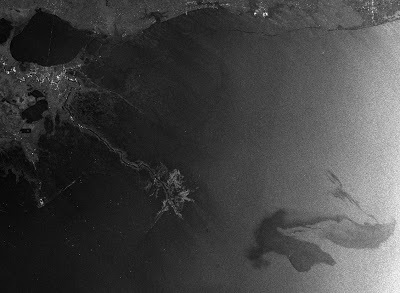 Satellite radar image taken April 26 clearly shows oil slick (lower right) from Deepwater Horizon spill. Source: European Space Agency. 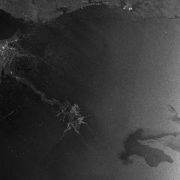 This, and other radar images that SkyTruth is getting, confirm what we’ve seen on the NASA/MODIS images so far, and support our conservative calculations showing that in the first week of this spill at least 6 million gallons have entered the Gulf. That’s a spill rate of at least 850,000 gallons (20,000 barrels) per day, 20 times larger than the official Goast Guard estimate of 42,000 gallons per day. The Australia blowout and spill took 10 weeks to control. The Exxon Valdez tanker spill totaled 11 million gallons. We could exceed that in just a few days, if we haven’t already. 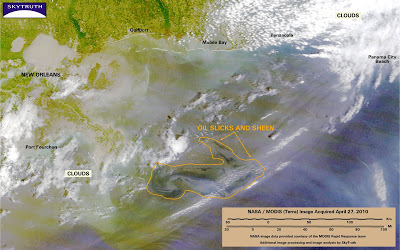 UPDATE 4/28/10 9:30 pm – A NASA/MODIS satellite image taken this afternoon has clouds, jet contrails and haze that obscure much of the oil slick, but shows the western edge of the slick is within 10 miles of shore. 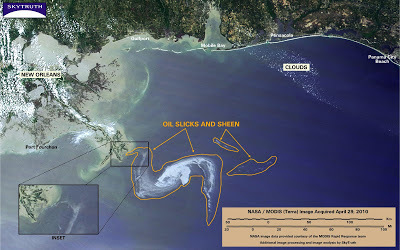 Gulf Oil Spill Rate Must Be Much Higher Than Stated – 6 Million Gallons So Far? 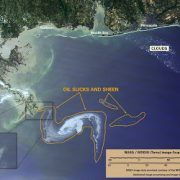 Based on SkyTruth’s latest satellite observations today of the size of the oil slick and published data on the thickness of floating oil at sea that produces a visible sheen (1 micron, or 0.000001 meters) we think the official estimate of the spill rate from the damaged well has been significantly too low. Immediately after the Deepwater Horizon rig sank on April 22, the Coast Guard estimated that the well was leaking 336,000 gallons (8,000 barrels) of oil per day. But for the past few days they’ve estimated the rate at 42,000 gallons (1,000 barrels) per day. We think it’s actually a lot closer to their original estimate. We have a visible oil slick covering 2,233 square miles (5,783 km2). 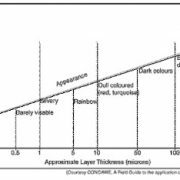 Given a minimum thickness of 1 micron (see chart below), that is 5,783 cubic meters of oil, or 1,527,706 gallons (36,374 barrels). The blowout happened almost 7 days ago on April 20. That’s at least 5,000 barrels of oil per day – assuming none of it was consumed during the two-day fire that raged before the rig sank on April 22, and none has been collected by the response crews that have been working diligently for days. So if 3% of today’s slick (173.5 km2) is 100 microns thick, and the remainder (5,609.5 km2) is 1 micron thick that’s a total of 22,960 cubic meters of oil: 6,065,390 gallons. That’s right: more than 6 million gallons spilled into the Gulf of Mexico so far. It turns out to be pretty easy to roughly estimate the amount of oil in a floating oil spill — though like all estimates, large doses of caution should be applied. 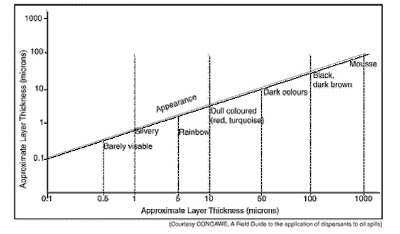 The critical variable is the thickness of the floating oil layer. The CONCAWE guidelines from back in the late 80s are a reasonable place to start. 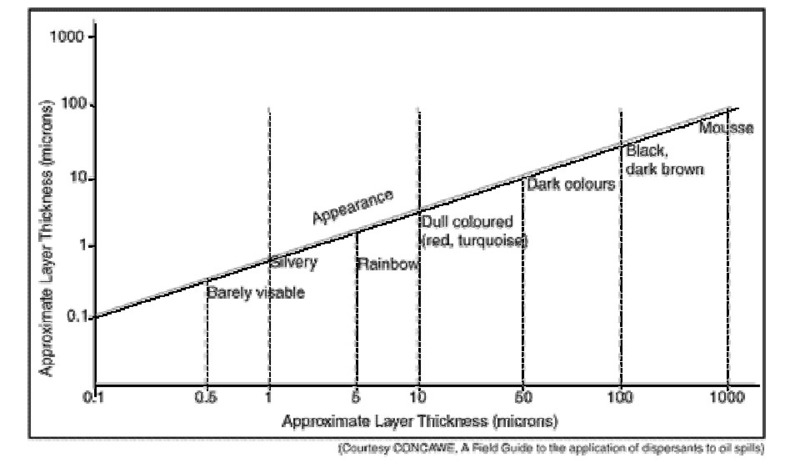 CONCAWE gives a chart of thickness and appearance as shown in the figure. Notice that the minimum visible thickness is about 1um. If we take 1 um as a bare minimum starting place, think that a square meter of oil spill with a 1 um layer means that there is a 1000000/th of a cubic meter of oil floating in that spot. If you have 1 sq km of oil floating on the sea *and* it has a uniform thickness of 1 um, well, you have a million of those layers or 1 cubic meter. That makes 1000 liters of oil or about 264 gallons (6.2 bbl) per sq km of spill. We are seeing conservative estimates of 1000 sq km already on April 25th–I believe you measured 800 sq miles which is closer to 2000 sq km. So for the minimum value on 25 April we have a minimum of 6,200 bbl of oil already on the water, which means that the 1000 bbl/day estimate we’ve been seeing is too low for an event that began on 21 April. However, this is probably a much too conservative estimate. This size in sq km of the floating oil spill may be greater by a factor of 2, as your estimate suggests. More important, the average thickness may be a factor of 10 or more greater. Certainly your more recent images suggest that the spill is locally dark and thick. Check the CONCAWE chart and you see that some of those sq km of ocean may represent 200 or 300 bbl of oil each. So it would not be unreasonable to multiply that 6,200 bbl number by 20. This gets you up to 126,000 bbl in the water, which is about 5,300,000 gallons. That’s roughly half the total Exxon Valdez spill. I do not think I am being too alarmist here–but you should check my numbers. It will be critical to get some more recent images to see how much the slick has grown in the past couple of days. https://skytruth.org/wp-content/uploads/2010/04/CONCOWEchart.jpg 234 400 John Amos /wp-content/uploads/2016/08/test_logo.png John Amos2010-04-27 23:14:002019-03-04 14:23:23Gulf Oil Spill Rate Must Be Much Higher Than Stated - 6 Million Gallons So Far? MODIS satellite image taken this afternoon, April 27, shows growing oil slick in the Gulf. Spectrally enhanced version allows easier identification of oil slick on this cloudy / hazy image.